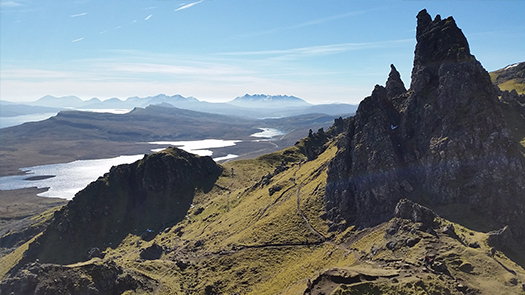 It was a perfect day for a trip to the Isle of Skye, one of the best day trips in the Scottish Highlands. Cool temperatures, no rain in the forecast and a nearly cloudless sky. I had an ambitious itinerary of sights that I wanted to see, so I got an early start. I took the shortest route from Inverness that took me through wild and mountainous country. At times, the road followed the scenic rail line with regular passenger service between Inverness and Kyle of Lochalsh. On the way I passed Loch Duich, one of many beautiful highlights on the road to Skye. It is a salt water fjord, or a sea loch. Here you will find the magnificent Eilean Donan, one of Scotland’s best known and most beloved castles. It is notable for both its dramatic setting and the interior. This 13th century marvel is fully restored, though I didn’t have a chance to visit. After crossing onto the island, I saw Mealt Falls and Kilt Rock. Both are easily accessible from the road, with dramatic views of rocky coastline in both directions and a good railing. So if you have a slight fear of heights or are traveling with kids, you’ll still be able to enjoy this view. I was sidetracked early by a tempting trail leading to the Old Man of Storr, a group of tall rock formations. I hadn’t planned on a hike, but once I stopped at the trailhead, I couldn’t resist. After about 40 minutes of uphill hiking, I was tired. However, I was enjoying some of the best views I’d seen in my life. I spent some time enjoying the view and was back in the parking lot less than two hours after I’d left. The hike was well worth it, but I had to miss Dunvegan Castle and the Talisker distillery tour. There was still plenty of light for my drive home via Loch Ness. I have good reasons to return another day to Skye. Next time I’ll leave even earlier. Be sure to check out our new Scottish Highlands Untour for the best of scenery and outdoors excursions.